The "U" in USB might as well stand for "ubiquitous" - it's a standard that's everywhere, used by most people many times every day. That means it's especially frustrating when you need more USB ports than you have (I'm looking at you, Macbooks). 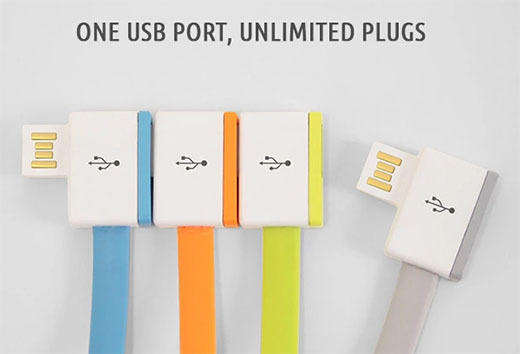 So here's a design which, if widely adopted, would really help: InfiniteUSB's plan is that every plug is also a port - so a plug doesn't take a port, but rather uses it and passes it along. I can think of more than a few times when this would come in handy - and those were just yesterday! Until everything's wireless and has infinite battery life (c'mon, future! ), something like this is a great idea.